Radiculopathy (aka pinched nerve): pain, numbness, tingling or weakness due to pressure on a nerve in spine. 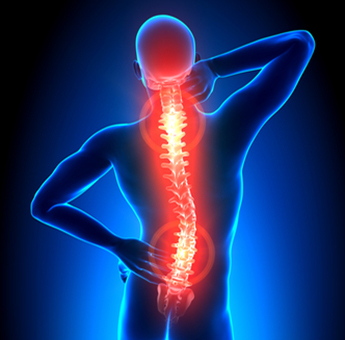 Radiculopathy is the word used to describe pain, weakness, tingling and numbness caused by nerve root irritation. Nerve roots are the bases of nerves as they branch off the spinal cord and through the foramen to connect to different parts of the body. The nerves also send signals to the brain to create sensations. Radiculopathy is usually caused by disc herniation or degenerative changes to the spine that put pressure on nerve roots. Radiculopathy can be felt on either or both sides of the body, depending on the cause. For example, the abnormal spinal curve created by scoliosis can compress the nerve roots on one side of the body. When the roots of the nerves are compressed, it causes muscle weakness, pain and numbness in the area connected to the affected nerves. For example, if nerves were being compressed in the cervical section of the spine, the patient would feel pain and numbness in the arms and upper chest. With lumbar radiculopathy, radiating downward pain from the back to the feet, called sciatica, is commonly a symptom. Thoracic radiculopathy is often mistaken for shingles, as it causes pain that goes from the middle of the back to the chest. Hypersensitivity to touch can also be a symptom of radiculopathy. To diagnose radiculopathy, a physician will review a patient's medical history, asking about the location and type of the symptoms to help determine if a nerve root is being affected. A physical exam will follow, focusing on range of motion and flexibility, as well as muscle strength, sensation, and reflexes to determine what nerve root is being compressed. To verify the diagnosis, several tests may be needed. An X-ray will be performed first, which can help identify the presence of trauma or osteoarthritis, as well as early signs of infection or tumor growth. A CT scan or an MRI may follow. A CT scan can show the amount of space nerve roots are allotted by the foramen, or openings in the vertebrae of the spine. An MRI scan can best reveal the location and extent of nerve compression because it is designed to show the soft tissues around the spine, including discs, ligaments and nerves. Symptoms can often be relieved by conservative treatments like anti-inflammatory medication, physical therapy, and rest. Bracing may be prescribed. Most patients respond well to this treatment, with symptoms improving from six weeks to three months. However, if there is evidence of nerve damage or if symptoms fail to improve over time, surgery may be needed to remove pressure from the spinal roots. The procedure needed varies according to the source of the nerve root compression and its location in the spine.